Developing hybrids through cross breeding in Volvariella volvacea, a popular tropical edible mushroom, is considered as difficult due to its unresolved life cycle and absence of biomarkers. In present study, the single spore isolates (SSIs) from three morphologically distinct V. volvacea strains were used for selecting high yielding SSIs, and developing high yielding hybrids followed by their evaluation for fruit body yield, nutritional profile and the shelf life. In successive evaluation trials, two SSIs from strain DMRO-484 of V. volvacea and three hybrids obtained after crossing between the SSIs of strains DMRO-185 and DMRO-247 as well as between SSIs of strains DMRO-247 and DMRO-484, gave higher fruit body yield compared to their parent strains. The fruit bodies from these hybrids were superior in vitamin D, crude fibre and the potassium: sodium ratio compared with parent strains. The fruit bodies from these SSIs and hybrids were at par in shelf life to that of parent strains mainly with respect to loss in weight, veil opening, change in colour and the TSS values on storage for 24–48 hours. 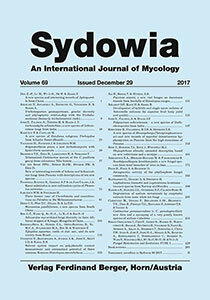 The study proves the possibility of developing high yielding and nutritionally superior hybrids in V. volvacea just as in case of A. bisporus. Keywords: Paddy straw mushroom, secondary homothallism, downward mycelial growth, nutritional properties, shelf life.